The Galaxy (0-1-0) play Real Salt Lake (1-0-1) in Sandy, Utah Saturday (live at 1 p.m. on NBCSN), while Chivas USA (1-0-1) play in Texas against 1-0-1 FC Dallas (streamed live here at 5:30 p.m. Saturday), but local fans can still watch the team’s play live and in person this weekend. 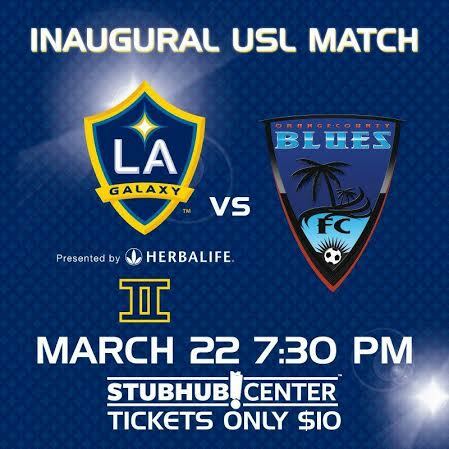 The Galaxy II play their inaugural USL Pro game against the newly-rebranded Orange County Blues at the track & field stadium on the Cal State Dominguez Hills campus. Parking is free. USL Pro games will also be streamed live this season on YouTube. The Galaxy II, led by Coach Curt Onalfo, will have a variety of talent at their disposal with Homegrown Players Jack McBean and Oscar Sorto set to compete alongside USL PRO veterans such as 2013 All-League selection Daniel Steres. The Blues, meanwhile, enter with a good returning group that is led by forward Chris Cortez. The former Chivas USA forward, who had nine goals a season ago, is set to be joined in attack by new addition Gibson Bardsley, who arrives after an All-League season with the Dayton Dutch Lions in 2013. The Blues will also have a new face in goal after former Chivas USA goalkeeper Patrick McLain joined the side. Later Friday the Galaxy announced players loaned to the Galaxy II are Rafael Garcia, Bradford Jamieson IV, Jack McBean, Raul Mendiola, Charlie Rugg and Oscar Sorto as well as a trio of other Galaxy players also available for selection Saturday Kyle Venter, Kofi Opare and Kenney Walker. Meanwhile, Chivas USA’s Youth Development Academy hosts a SuperClasico tripleheader Saturday against the Galaxy at the Bell Gardens Sports Complex, 8000 Park Lane. The U13/U14 teams face off at 9:30 a.m., followed by the U17/U18 teams at noon and the U15/16 teams at 2:30 p.m. This entry was posted in Chivas USA, Galaxy, Major League Soccer, United Soccer League, Youth Soccer by Nick Green. Bookmark the permalink.